A.J. Howard, left, and Chris Rizer raise the American flag at Brown Cemetery on Flag Day, signifying the completion of a four-month reclamation project there. Also pictured is Jacob Petry. The three Wahama High School seniors took on the project, working evenings and weekends throughout the spring. 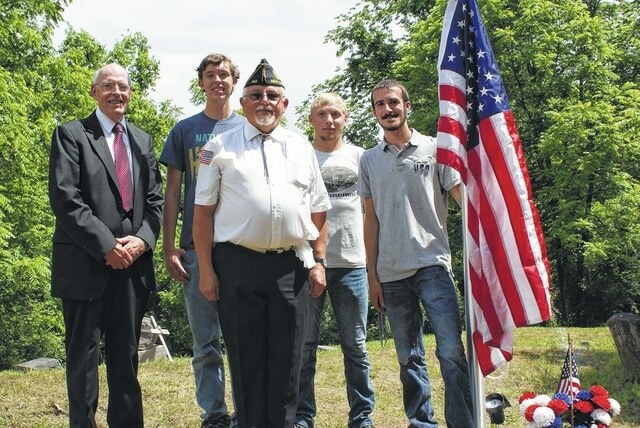 A flag-raising ceremony was held at Brown Cemetery in Hartford Sunday signifying the completion of a reclamation project by three senior boys from Wahama High School. Pictured from left are Kenneth Vickers of the Smith-Capehart American Legion Post 140 of New Haven; Chris Rizer, who initiated the cemetery cleanup; Legion Commander David Sigman; Jacob Petry; and A.J. Howard. The boys, along with other students, have worked almost four months getting the cemetery back into shape. HARTFORD — Flag Day symbolized the climax of a four-month project Sunday at the Brown Cemetery in Hartford. The red, white and blue was raised over the cemetery, signifying the completion of a reclamation project primarily completed by three senior boys from Wahama High School. Chris Rizer came across the forgotten and overgrown cemetery during research for his senior project. Rizer could not get the cemetery off his mind, and decided to do something about it. With the help of friends A.J. Howard and Jacob Petry, they cut down trees, cleared brush, cut through briars, and uprighted headstones. They spent their spring evenings and most weekends at the cemetery, and several other students helped along the way. On Sunday, the American flag was raised on a new flag pole set by the three boys and donated by the Woodmen of the World. Two members of the Smith-Capehart American Legion Post 140 of New Haven, Commander David Sigman and Kenneth Vickers, led the ceremony. Sigman recognized the boys for their efforts, as well as all those who helped or donated money and supplies. He dedicated the flag to the veterans and others who are laid to rest at the ceremony. Among others attending were Hartford council members Patty Neil, David Burris and Carol Spencer, who presented Hartford residents Rizer and Howard with scholarship checks from the town. Legion member Vickers is also a member of the New Haven town council, and Becky Pearson, a Mason council member-elect, attended as well. The boys said while the project is mostly done, there are still a few things they want to do. A new fence has been purchased but needs installed; stumps need removed to make mowing easier; and a few older stones need repaired. Even though Petry will be leaving for the Army in July, and Rizer and Howard will be attending college in the fall, they are working to ensure their efforts weren’t all for naught. The boys are seeking funding for the upkeep and mowing of the cemetery. Nearly 500 people are buried in Brown Cemetery. Among them are many of Hartford’s early residents, and veterans from as early as the Civil War. The earliest grave found is from 1830. Anyone wanting to assist the boys in completing the project can call Rizer at 304-882-3246.